This is one of the few supplements that actually works well and helps the older dogs suffering from arthritis and other joint problems. They become more comfortable and mobile. ASU from soybeans and avocados helps increase the effects of other joint support ingredients in this product. A lot of customers say there is a huge positive response just a few weeks of taking this product. Can be administered to dogs easily in the form of chewable tablets or soft chews. Excellent for dogs that show an early need for joint support and pets that suffer from arthritis and types of joint pain. – We couldn’t find any! We give it a 10/10. Nutramax have truly created an amazing supplement, which is proven by the fact that a lot of testing was done in order to prove it, along with the clinical tests. This is all further proven with numerous positive reviews of the product left by the customers. There are cheaper supplements on the market, but there aren’t any that work better than Dasuquin and that could help your dog with a joint pain more. There really aren’t that many supplements that are both effective and that have been widely recommended by veterinarians all over the country. Well, such is the case with Nutramax Dasuquin for Dogs with MSM, which is a supplement that works amazingly well with older dogs that have been suffering from arthritis as well as with dogs that have been suffering from various other joint problems which are having trouble with moving and being comfortable. 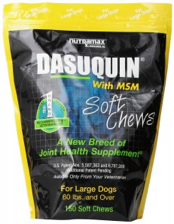 Today, we can find numerous various joint supplements on the market, which is a good thing, but it would appear that Dasuquin is the best one of all of them due to the fact that it has been able to help many dogs and their owners truly appreciate this. 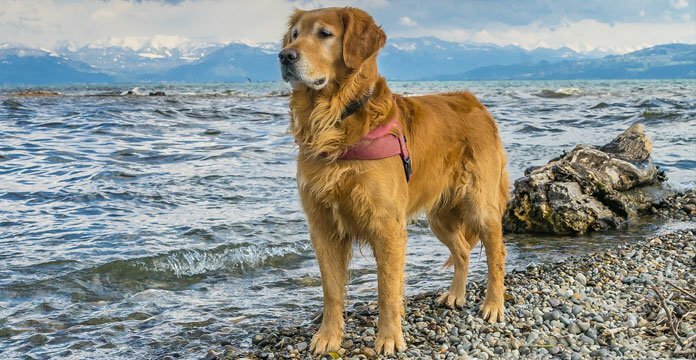 These people have been trying to find a way to help their dogs, and it appears that they have found a way to do so and relieve their pets of that terrible joint pain. The great thing about this product is the fact that the side effects it offers are really minimal, and its efficiency is, according to the dog owners, rather amazing. We will attempt to cover this all in this review and to tell you all about various aspects of this product; and all with the goal of allowing you to see what Dasuquin really is and to understand how it works. The side-effects of this supplement seem to be minimal, and its efficacy appears significant to say the least. This review covers all of these aspects and more to help you get the complete picture of Dasuquin. *It should be noted that Dasuquin is a product that was designed both large dogs (over 60 lbs) and small/medium dogs with the difference being their weight. So, first, let us tell you what Dasuquin really is. It is a supplement with a dial synergistic formula that manages to promote healthy joints in dogs. Many don’t really know what kind of formula this is, but it is nothing that should scare you; it is a formula made up of completely natural components, which can offer huge benefits to the older dogs who are having trouble with their joints and immobility. It is exactly because of this formula that we can safely say that Dasuquin is a 100% natural product, which basically means that you have nothing to worry about, and especially not about any harmful chemicals that could risk your dog’s health. This supplement has undergone 10 years of clinical use, and a great deal of time was spent on research as well, indicating that this supplement is completely safe and healthy. The dog owners ought to know that there isn’t just one type of Dasuquin out there, but that there are various different types of this supplement on the market, and some of them are designed for cats, while others are meant to be used by the dogs. The main difference between these various types of this supplement are the ingredients out of which they are made. So, when buying this supplement, make sure you buy the right one in order to get the most out of it and reap all the benefits of it. The great news is the fact that Dasuquin is a product that can be found in various forms: as chewable tablets or as soft chews. It all depends on what your dog likes more, and that’s what you should be basing your decision on. A great thing about this supplement is the fact that it comes in the form of chewable tablets, which the gods just love! They can consume them without any problems, making this type of supplements perfect. This is exactly why so many dog owners choose this particular supplement – they can just give it to the dog together with their food. Also, this is an amazing thing if you have one of those dogs that seem to be having problems with taking their medication. In such a case, the chewable supplement might be the best option. Another great quality of this chewable supplement is its taste that the dogs fin delicious, allowing them to eat it without any problems. This allows you peace of mind for not having to worry if the dog is going to eat the supplement or not or not having to watch him actually eat it in order to be sure – don’t worry, he’s going to eat this one. There is another type of this particular supplement, and that is the Dasuquin in the form of a soft chew. These things are ideal for dogs that are usually having trouble eating the chewable tablets, or just avoid them for some reason. As the very name suggests, these tablets can be easily chewed up, and what’s even more important, they can easily be swallowed without having to worry about whether your dog is going to make it or have any issues because of it later on. This is especially recommended to all the dog owners who have small dogs. The smaller dogs tend to struggle with other types of food, and that is why the soft chews would be just perfect for them. It is really important to know what it is that Dasuquin is made of in order to know how it actually works. One of the ingredients of this supplement is the ASU, which stands for Avocado/Soybean Unsaponifiables, which, as the very name suggests, comes from soybeans and avocado, and is used to promote healthy joints. Thanks to the ASU, which has been proven to improve the joint function as well as the level of comfort in dogs suffering from arthritis, this is one of the best supplements used to help combat those issues and difficulties which can influence dog’s health and life in a negative way. Numerous studies have been done on ASU, and they have all shown that it allows for a reduction of the production of various compounds that have to do with the breaking down of the cartilage in dogs over time. ASU is to thank for creating positive effects, together with all the other ingredients which can be found in Dasuquin supplement. The ingredient called glucosamine that can be found in these supplements is synergistic with the low molecular weight chondroitin sulfate, which basically tells us that it works in pair with the ASU to help the dogs overcome the pain in their joint, as well as the discomfort that it causes. Dasuquin is a product that offers numerous benefits, and one of them definitely has to be the ability that this supplement has to relieve the dogs of pain and the discomfort that occurs due to arthritis that they’re suffering from. Over time, as the dogs get older and older, their cartilage, as well as joints, become worn down, due to their constant use, just like it is with humans. And it is this supplement that offers great results in the field of increasing the level of comfort that your dog feels, as well as in the field of mobility of the dogs suffering from mild to severe pain. Some dogs experience joint pain as something mild, and usually, rather unnoticeable, but there are those others that experience this pain as crippling. Therefore, if you are a dog owner whose pet is constantly feeling pain due to joint problems, then Dasuquin is a supplement that is definitely going to help out. Most dog owners that have bought this product and have given it to their pet say that within a couple of weeks, the first noticeable positive results may be observed. Although it should be said that not every dog responds to this supplement the same way, most of them have experienced a decrease in joint pain and an increase in mobility, which is extremely important for dogs. Even though it is necessary to point out that the dogs suffering from the case of severe arthritis might never fully restore the mobility, it is these supplements that are going to be extremely beneficial in reducing the discomfort that these dogs feel, and in increasing the mobility of them, even of the older dogs! There are many vets out there that keep recommending this product to the owners of the dogs that are feeling any type of pain connected to their joint issue. These veterinarians as the dog owners to start their poets on Dasuquin exactly because these vets know that this product works well and that really manages to help some of these animals. Most people hate the fact that they have to pay for around $60 per bottle, but they know that this product can actually help them save some money in the long run, due to the fact that this product allows the owners not to have to take their pet to the veterinarian so much and so frequently. So basically, these supplements can help out both the dogs and their owners as well. As we have already mentioned, Dasuquin is a supplement for dogs that have proven to be highly effective when it comes to relieving the dogs suffering from arthritis from pain and other forms of discomfort. However, a word or two about the side effects of this product need to be said, but the problem lies in the fact that the safety studies were done on this product clearly state that there are no negative side effects connected to the Dasuquin supplements. Even though there were cases of dogs that have taken these supplements experiencing some sort of gastrointestinal upset, but these are the same occurrences that happen whenever a dog switches from one type of food to another; after all, the same thing happens to humans as well. And other than this, no other side effects have been seen. We’ve already stated above that every dog is different and that not every dog reacts to a certain product the same way, and that something that should be kept in mind here. So, not all reactions are side effects. We’ve already mentioned that this product comes in different types and that it has been approved to be used by both cats and dogs, but the owner needs to calculate in a number of factors that could determine how their pet is going to react to these supplements. If your pet has some kind of an allergy, that could lead to side effects and every owner ought to know that, but also to be familiar with the fact that this is not a problem caused by this product. Also, if the product is being misused, it could lead to unknown effects. 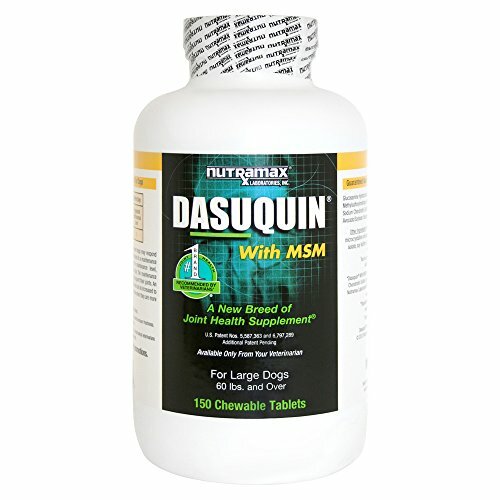 But overall, the product is safe for pets, but the owners just need to make sure that they are using it properly, or else it could lead to certain gastrointestinal problems in some dogs, and this is pretty much all there is when it comes to the side effects of Naturmax Dasuquin for Dogs with MSM. Like any other supplement on this world, this one also has some pros and some cons as well. However, when it comes to this particular supplement, people say that the pros greatly overweight the cons due to the fact that they offer some comfort and the pain relief to all the dogs that have been experiencing joint problems. Many of these dog owners have stated that their pets’ mobility has greatly increased after they have started administering this supplement to them. If you have a dog that has started not to walk or run around or is unable to do so, try giving him some Dasuquin, and the dog’s mood will start to improve, along with the mobility. Now, speaking of the cons that this product has, the most important one seems to be the fact that not all dogs respond well to it. There are some dogs with serious and crippling arthritis that have not responded to this supplement as good as the others. The general consensus seems to be that the less severe the joint problem with the dog is, the more likely it is for the dog to recover and benefit from the supplement. It appears that Dasuquin does not work that well for all of the dogs that have used it. There is another flaw of this product is the fact that you might upset your dog’s stomach by giving this supplement to him, which could cause some nausea and vomiting. A lot of dog owners have responded that their dogs have either vomited or have had the runs that were caused by this product. And there is one more con of this product, and that is its price. The usual price of this product stands around $65, but the bottle you get for this amount of money is rather small. This causes some dog owners to think that the product is rather costly, and since they need to administer this supplement to their dog over a longer period of time, the costs add up really fast. However, the average number of tablets you receive is 150 per bottle. That’s a lot more than other brands like Extend Joint Care provide at their price is only slightly less. As we have already said, there are two types of these tablets, the soft chewy ones and those that come in chewable tablets. 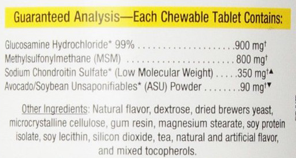 The chew ones contain glucosamine hydrochloride 900 mg for large dogs, 600 mg for small dogs), the ASU, 90 mg for large dogs, 45 mg for small dogs and the sodium chondroitin sulfate (350 mg for large dogs, 250 mg for small dogs). When it comes to the chewable tablets, the dosage and the ingredients are the same as in the soft chew type of the product, but they do have a different texture. All of the ingredients that can be found in this joint supplement are 100% natural, and should not cause any serious side effects to your dog, unlike the products full of various chemicals. All the ingredients found in this supplement are completely safe for your dog and the best thing about them is the fact that they work together to do their best to minimize the pain your dog might be feeling due to the joint problems, and the discomfort caused by the very same issue. It is really important for the dog owners to know the recommended dosage in order for their dogs to be able to benefit from the product as much as possible. Also, following the recommended dosage allows your dog not to experience any negative effects. As we have previously mentioned, Dasuquin is a product that is intended for both the smaller and the bigger dogs, and their dosage depends exactly on their size, or more precisely, on their weight. The usual difference between the dosages is around 100 mg for each active ingredient which can be found in this product. Let’s illustrate this on the ingredient called glucosamine. 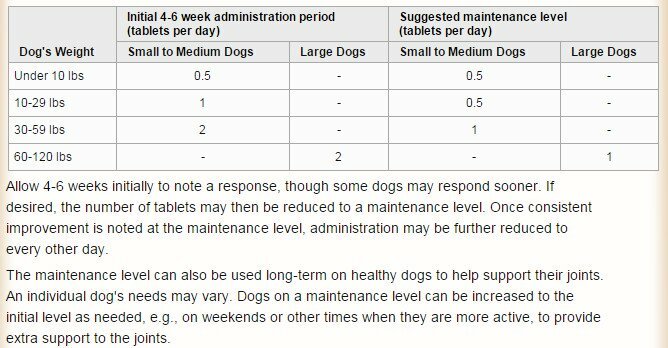 This is an ingredient which should be given in the amount of 900 mg for the larger dogs, and 600 mg for the smaller dogs. Giving the right dosage to your dog is extremely important because that is the only way for your dog to experience all the benefits of this supplement. There are many vets out there that recommend the dogs to first start taking Cosequin due to the fact that it is extremely effective, but when the Cosequin runs out, the vets agree that the dogs should start taking Dasuquin. This is mostly because of the fact that Dasuquin is a product that is still considered to be new on the market, but it is universally recognized that it is one of the most efficient ones when it comes to relieving the dogs of pain caused by the wear and tear on the cartilage. Cosequin is a product that contains both TRH122 chondroitin sulfate, as well as the FCHG-49 glucosamine. Also, it contains manganese ascorbate, and combining it with the two previously mentioned ingredients, the formula encourages great joint health in dogs. It should be said that this does not mean that this product is better than Dasuquin, and neither the vets agree on that, but it doesn’t necessarily have to be the other way around as well. The fact remains that Cosequin has been on the market for a long time, and that is why some consider it to be a far better supplement for helping dogs with joint issues. The dog owners that have purchased and tried out Dasuquin have written quite a few of the reviews on this product, and some of them are positive, while the others are negative. There seems to be a huge number of owners complaining that their dog’s been having trouble keeping the tablets in his stomach, but that was to be expected because of the ingredients which can be found in this product. But, there are also those owners who have said that they have been amazed by the improvement their dog has made since he’s been taking this supplement. They say that the dog’s mobility has started to improve after about 2 or 3 weeks of taking the tablets, and many of these people have said that this product has greatly helped their god and that thanks to it, their dog can move and walk about once again. Most of the owners say that they would recommend Dasuquin to other dog owners and that the product has been recommended to them also, and most of these recommendations have come from their vets. Most of these people have bought this product in order to help their dog with serious arthritis issue or joint pain, and even though some negative comments can be found, the overall consensus seems to be that this supplement offers positive results and that the dogs can benefit from it. If your dog is suffering from arthritis, you may wish to look into CBD oil for dogs.